Situated in the middle of historic Dubai, the 5-star The Canvas Hotel Dubai MGallery By Sofitel features modern accommodations. The Canvas Hotel Dubai s located in Bur Dubai, within walking distance from Dubai Museum, Dubai Creek, the Heritage Centre of the city and Gold Souk. It offers a 1000 m² spa and free Wi-Fi is available in the entire hotel. The rooms feature a modern style, and include a seating area with a flat-screen TV. The bathroom has a bathtub and a shower, and includes free toiletries. Guests can relax at the outdoor swimming pool located on the rooftop or visit the spacious spa. The hotel has two restaurants, Signature by Sanjeev Kapoor and Azalya International Buffet Restaurant serving contemporary International cuisine. It also has themed bars such as Estrellas Skyline Lounge, Alfonso X Sushi & Cigar Lounge and Quantum Sports Bar. 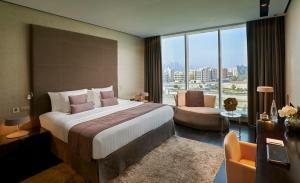 The Canvas Hotel Dubai MGallery By Sofitel is 12 km from Dubai International Airport. Free parking is available inside the hotel's private parking space. The credit card used for a prepaid booking must be presented at check-in. The hotel reserves the right to deny check-in or collect a guarantee payment in case the card is not available. Please note there is a compulsory / Non-Refundable New Year’s Gala Dinner for all guests staying over 31 December 2018 fixed to AED 499 per adult and AED 249.50 per child (6-12 years) Please note the Gala dinner charges are additional to the room rate booked. Guests are required to show a photo identification and credit card upon check-in. Please note that all Special Requests are subject to availability and additional charges may apply. Please inform The Canvas Hotel Dubai MGallery By Sofitel in advance of your expected arrival time. You can use the Special Requests box when booking, or contact the property directly with the contact details provided in your confirmation. This double room has a iPod dock, bathrobe and satellite TV. 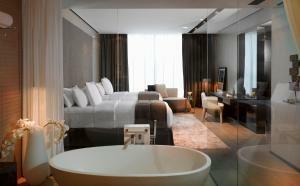 This twin room features a minibar, seating area and bathrobe. This triple room has a seating area, bathrobe and minibar. 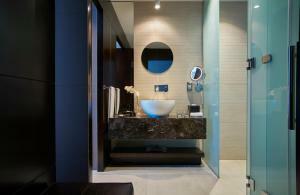 This suite features a minibar, seating area and bathrobe. This triple room has a iPod dock, air conditioning and minibar.